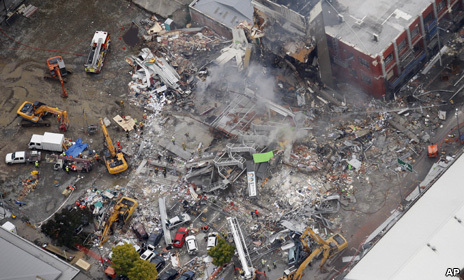 Officials in New Zealand have released the first four names of the 113 confirmed victims of Tuesday's earthquake in the city of Christchurch. They include two adults and two infants - aged five and nine months. Rescue workers are still combing through rubble but no survivors have been found since Wednesday afternoon. Police say about 200 people are missing, including 122 believed to have been in one collapsed building where it is thought no-one could have survived. Foreign Minister Murray McCully said the government was preparing to give family members from several countries "the worst type of news". "This is not just New Zealand's tragedy," he said, adding that the country was very grateful for the incredible response of the international community. Civil Defence Minister John Carter said that five bodies had been recovered in central Christchurch overnight. "We are still hopeful there will still be people rescued but it is becoming unlikely," he said at a news conference in the capital, Wellington, on Friday morning. He described the level of devastation as "unbelievable". The 6.3-magnitude earthquake struck at a shallow depth of 5km (3.1 miles) early on Tuesday afternoon, when the South Island city was at its busiest. 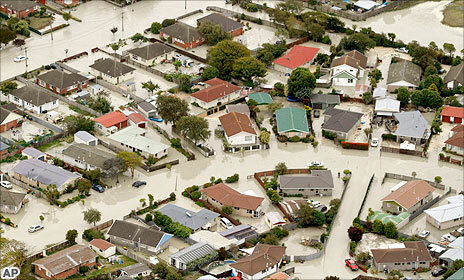 It was Christchurch's second major tremor in five months, and New Zealand's deadliest natural disaster for 80 years. Other countries have begun releasing names of their nationals who they say were killed. The UK's foreign office said two Britons died in the earthquake, and New Zealand media have published tributes to a number of people who relatives and friends say were killed, though their names have not been officially released. It is not clear how baby Baxter Gowland was killed, but Jayden Harris was crushed by a falling television set at his home, the New Zealand Herald said. "He hadn't even started to crawl," the boy's grandmother Linda Nash told the paper. Officials said rigorous identification procedures were being followed to avoid mistakes in naming victims. Christchurch Coroner Sue Johnson has appealed for families of missing people to describe any distinguishing marks on their relatives such as tattoos, and the clothing and any jewellery they were wearing, so the information can be compared to bodies in the mortuary. Prime Minister John Key has said more than 200 people are believed to have died. Around 2,500 people have been injured, 164 seriously. More than 350 foreign search and rescue specialists from seven countries are helping local crews look for survivors. The leader of a British team said they were still hopeful of finding survivors. "We are very optimistic that we could still come across live casualties," said firefighter Scott Imray. CLICKABLE Select the images for more details. Streets in the north-eastern suburb of Bexley were flooded as the quake caused water mains to burst, which coincided with heavy rain. 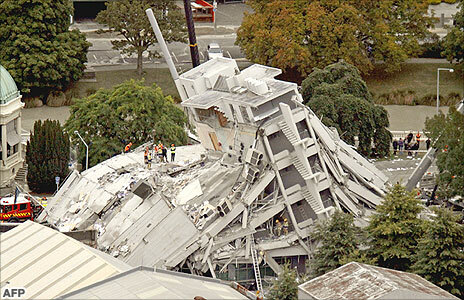 The multi-storey Pyne Gould Guinness Building, which normally houses around 200 workers, collapsed. A number of people were thought to be trapped inside. 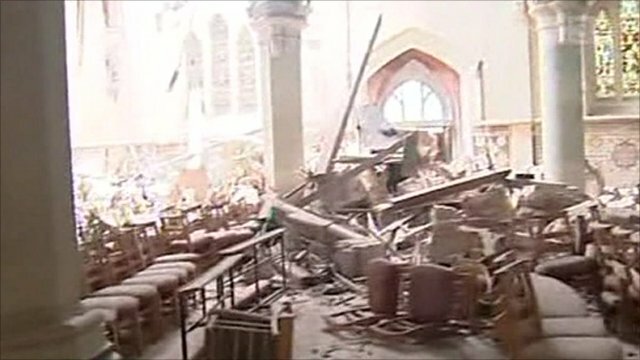 The 63m spire of the city's Anglican cathedral was toppled by the earthquake. A New Zealand TV reporter took a look inside the damaged building. Part of Christchurch's Canterbury Television [CTV] building completely collapsed in the earthquake. Some 24 people have been rescued from the building, but police said there might be between 60 and 120 bodies trapped underneath. In the aftermath of the earthquake, Rhys Taylor took this video on Oxford Terrace, 50 metres away from the city's main hospital. 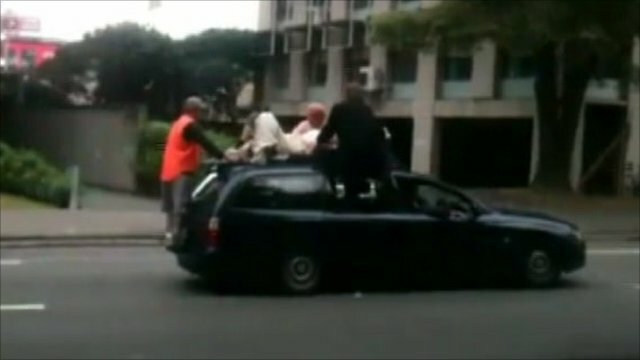 He said: "Cars were being used as ambulances to transport the injured." "Obviously the longer it goes on, the less chance there is of survivors being found, but people are quite resilient and they can last a considerable period without food and water if they are in a reasonably safe area within a collapsed structure." About 600 search and rescue workers are using sniffer dogs, sound detectors, thermal imaging equipment and cameras to detect any signs of life. The influx of foreign specialists has allowed crews to broaden the search area to buildings and districts that had not yet been checked. Police have already said there was no chance that anyone survived within the collapsed Canterbury Television building, where up to 122 people are thought to have perished, including at least 80 students and staff of an English-language school. The building contained the offices of a local TV station, a nursing school and the King's Education school. Studying at the school were dozens of Japanese, Chinese and Filipino nationals who are missing. Twenty-two people, most of them tourists, are now believed to have died when the spire of Christchurch's landmark cathedral collapsed. The city's tallest building, the badly-damaged Hotel Grand Chancellor, has remained standing despite fears it could collapse from the sizeable aftershocks which continue to shake the area. Many buildings were already damaged by September's earthquake, which was more powerful but was centred further from the city and at a greater depth. A JP Morgan analyst has estimated the insurance losses at $12bn. A number of major roads, bridges and tunnels have been damaged and are closed. Engineers are starting to go through the city district-by-district to assess damage. Officials say the electricity supply has been restored to 75% of the city and water to 40%. Residents are being advised to conserve water and boil it twice before drinking due to the possibility of sewage contamination. Hundreds of portable toilets have been set up and more are on the way and water tankers have been deployed at 14 locations throughout the city to allow people to fill buckets and bottles. Meanwhile, GNS Science geologist Kelvin Berryman said Tuesday's tremor was an aftershock of the 7.1-magnitude earthquake that struck Christchurch in September, but caused no fatalities. He also said the location of the epicentre - beneath the Port Hills - meant a large amount of seismic energy reflected off hard volcanic rock, compounding the impact at the surface. Are you in New Zealand? Have you been affected by the earthquake? Get in touch with us.